Several things can cause a Wi-Fi to stop working. You may be having network problems for a number of reasons, such as hardware problems, router WEP, WPA, or WPA2 security key issues, and connection issues. 1-Make Sure That Your Router Is Turned On. This is very simple. Check your router to see if it is working properly. For instance, blinking power buttons may mean corrupted firmware. Check your router’s manual, if you think there is a problem. Also check all cables and make sure that everything is properly connected. For instance, ensure that your router is connected to your modem. Here is Apple’s recommended settings for Wi-Fi. 2-Make Sure That You Are Within Range. Different Wi-Fi routers support different Wi-Fi ranges If you are too far from your router, your device may not connect to the Internet at higher speeds or stay connected more reliably. Change your location to see if your connection improves or not. 3-Make Sure That The Internet Is Working. The problem may be your Internet. Make sure that you have a connection to the internet. Try to connect to the Internet using another device, like your iPhone, Mac etc. If other devices can connect, we can assume that the problem is your iPad. If you cannot get online, you may want to call your internet service provider. 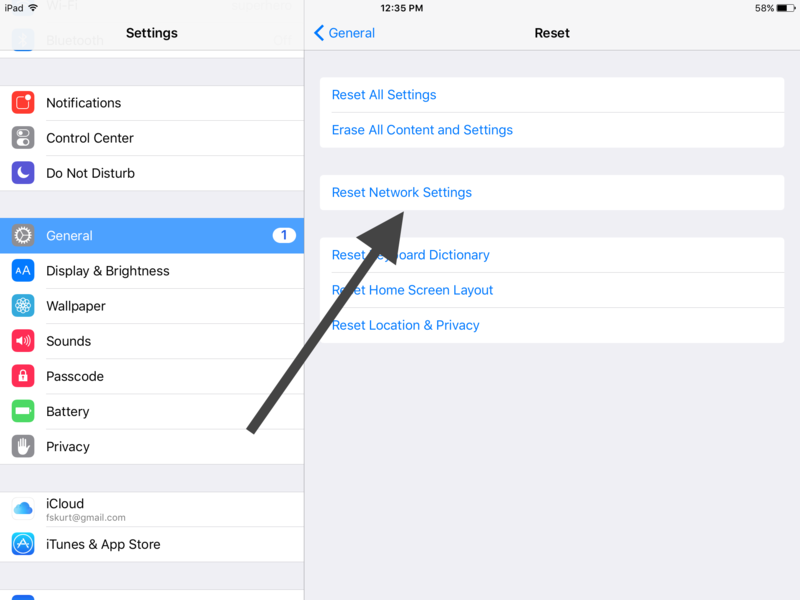 4-Reboot Your iPad and Your Wireless Router and Modem. This step is simple. Simply restart your iPad and router. To restart your router, turn off your router, wait 10 or 15 seconds and turn back on. 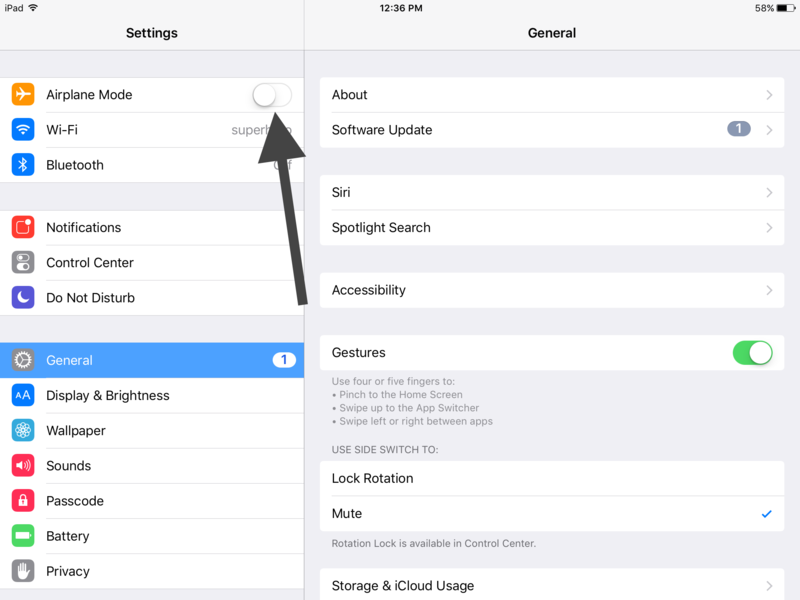 If this does not fix your issue, now restart your iPad by pressing and holding the sleep/wake button. Slide the slider once you see the red slider. Wait a few seconds. Once your iPad turns off, turn on by pressing and holding the sleep/wake button until you see the Apple logo. Tap Network Settings. Tap Settings > General > Reset > Reset Network Settings. Note that this action removes your stored Wi-Fi settings and passwords. Resetting your router to factory defaults may fix this issue. Check your router’s manual. This can usually be done by pressing and holding the Reset button for 10 seconds. This action will reset your router. 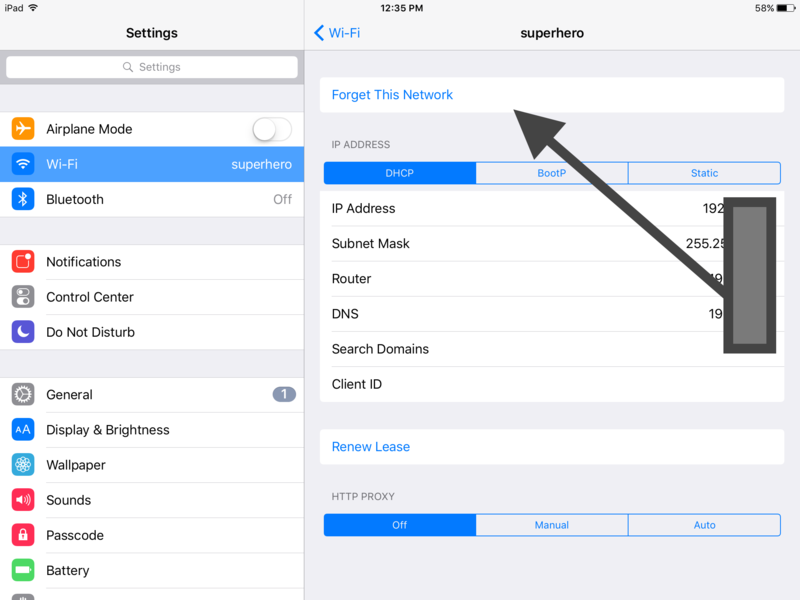 On your iPad, tap Settings > Wifi then find the Wi-Fi name tap the blue (i) info sign and Forget This Network. After, rejoin. Go to Settings > Airplane Mode and turn on, wait a few seconds, then turn off. Turn Wi-Fi off, and then turn it back on by going to Settings > Wi-Fi. Make sure that you have the latest iOS. If not, update your device. 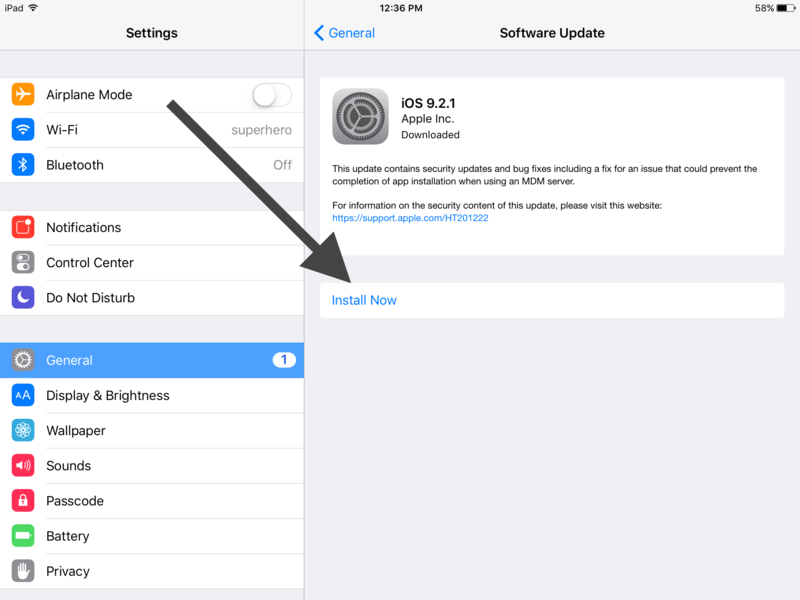 To check, go to Settings > General > Software Update. Try using Wi-Fi Protected Access 2 (WPA2) on your wireless router, if not already. Force restarting your iPad may help. You can do this by holding down the Sleep/Wake button and the Home button at the same until you see the Apple logo. Go to Settings > Cellular scroll down and find the Wi-Fi Assist option. Toggle this off, wait a few seconds and on again. I have not been able to connect my iPad to my office wifi since the iOS 9 update in Sept 2015 . I kept getting an “incorrect password” error. I have tried changing numerous settings on iPad and the Belkin Modem/Router and done numerous restarts but no success. Today I logged into the modem/router setup (Belkin N series) and under mac addresses there was an option to clone the PCs mac address to the router. Once I did this my ipad was able to connect without the “incorrect password” error. Reset network settings and now its connected . Thank you! 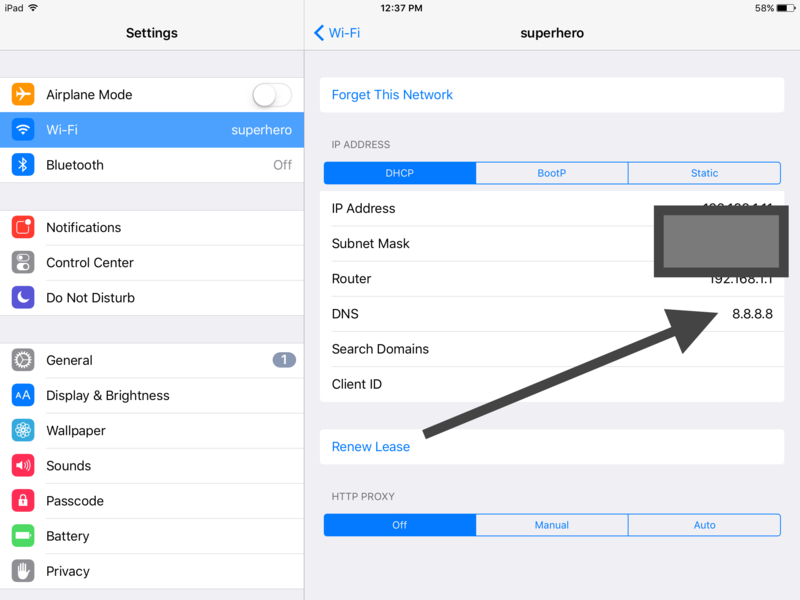 Ipad mini 2 will not list certain public wifi locations. (not even see the wifi access point. I pull out my android phone, identify the site in a long list of surrounding sites and watch youtube videos so the signal is there but can not be identified? I notice the list of wifi networks is much shorter with the Ipad. (compare to the Android phone) Tried Resetting Network and power down with no success. This particular restaurant site has no password. updated to faster speed internet per tech, and he said all ready to go, when later tried ipad and laptop they will not connect to wifi. Main desktop works fine where modem/router are with. Tried resetting all and nothing changes. Any simple easy steps please, to get them connected. Says my (name) for connecting to is not connected? Help! Thanks! I have try everything that it told me to do,but not done a whole restore on my Ipad 4 generation.It was working when I had charter now I have att.I have rebooted the modem.I have no clue what is wrong.Can any one please help me?